To Cite: Gao H, Lin S, Lv X, Ma H, Wang X, et al. The Identification of Two New ABCB11 Gene Mutations and the Treatment Outcome in a Young Adult with Benign Recurrent Intrahepatic Cholestasis: A Case Report, Hepat Mon. 2017 ; 17(10):e55087. doi: 10.5812/hepatmon.55087. Introduction: Benign recurrent intrahepatic cholestasis (BRIC) is a rare autosomal recessive disease characterized by recurrent episodes of severe pruritus and jaundice. Although the disease symptom will relieve spontaneously without leaving any hepatic injury, the ceaseless attacks would reduce the life quality of patients. However, there is not a validated treatment for BRIC yet. Considering the limited cases and the unpredictability of this disease, the publications of well-described case reports are necessary for the investigation of disease development and treatment efficacy. Case Presentation: A 26-year-old Chinese male, with clinical approved and genetic diagnosis of BRIC, experienced 3 attacks of recurrent intrahepatic cholestasis from 2010 to 2016. During hospitalizations, he received symptomatic treatments and plasmapheresis therapies. Both plasma exchange (PE) and plasma bilirubin adsorption (PBA) were conducted for him. The whole-exome sequencing revealed several single nucleotide polymorphisms (SNPs) as well as 2 novel mutations in ABCB11 (c.70A > T, p.Lys24*, exon2 and c.1417G > A, p.Asp473Asn, exon13). These SNPs and mutations might be associated with the BRIC development. Conclusions: Both medications and plasmapheresis interventions could relieve the patient’s symptoms, however, neither could shorten the natural process of the disease. The 2 mutations (c.70A > T and c.1417G > A) in ABCB11 were first reported in a BRIC patient. Benign recurrent intrahepatic cholestasis (BRIC) is a rare autosomal recessive or sporadic disorder (less than 1/50,000 - 100,000 people worldwide) characterized by recurrent episodes of intense pruritus and jaundice, which will recover spontaneously. The first onset of the disease can happen at any age, however, nearly 80% of cases experience their first symptoms in early adolescence (1, 2). The factors responsible for initiating an attack are unclear. Some attacks are followed with an upper respiration tract infection, while others were in a state of disturbance of hormone milieu after pregnancy or consuming oral contraceptives (3, 4). Although BRIC is a benign disease, patients with frequent onsets will suffer physically and mentally. The anxiety of a future with ceaseless disease attacks drove some BRIC patients to commit suicide or to choose liver transplantation solely to improve their life quality, even though it is known that the frequency of attacks would diminish with age increase (5). The diagnosis standard of BRIC is not established yet. Some researchers proposed a criteria as follows: (1) at least 2 episodes of jaundice with asymptomatic interval from months to years, (2) Laboratory investigations indicating intrahepatic cholestasis, (3) Cholestasis induced severe pruritus; (4) Cholangiography showing normal intra- and extra hepatic bile ducts; (5) Liver biopsy suggesting centrilobular cholestasis; 6) Absence of other causes of cholestasis (6). As a genetic disease, 3 genes are associated with BRIC, which are ATPase phospholipid transporting 8B1 (ATP8B1), ATP binding cassette subfamily B member 11 (ABCB11), and ATP binding cassette subfamily B member 4 (ABCB4) (4, 7). The study of BRIC was mostly based on the publication of full-presented cases. Therefore, we reported on a 26 year old male presented with intermittent episodes of jaundice and pruritus in our hospital. The male was born in 1990. He experienced his first onset with fatigue, itch, yellow urine and eye color, as well as was referred to our hospital in June 2010. There was no history of upper respiratory tract infection, viral hepatitis, and family liver diseases. He denied using any toxins or other drugs, which may lead to liver injury. Physical examinations showed that he was icteric and had scratches all over his body due to severe itching. His liver and spleen were impalpable in both hypochondriac regions. The liver function test showed total bilirubin (TBIL) 426.6umol/L (normal range 3 - 25), direct bilirubin 184.2umol/L, alanine aminotransferase (ALT) 137U/L (normal range 9 - 50), aspartate aminotransferase (AST) 101U/L (normal range 15 - 40), alkaline phosphatase (ALP) 135U/L (normal range 45 - 125), total bile acid (TBA) 345umol/L (normal range 0.2 - 14), and normal gamma-glutamyltransferase (GGT). The blood test, serum lipid, renal function, thyroid function, as well as coagulation parameters were all normal. Auto-antibodies test showed positive of anti-nucleus antibody, however, it was in a low titer (1:100). Serum tests for viral hepatitis including HAV, HBV, HCV, and HDV were all negative. Epstein-Barr virus (EBV) and cytomegalovirus (CMV) were also negative. The Wilson disease was ruled out with normal level of serum cooper and ceruloplasmin. Imaging examination showed a slightly enlarge spleen and without anatomical obstruction. Liver biopsy was conducted on October 2010 and the pathological diagnosis reported a diffuse cholestasis in bile capillaries of hepatic lobules, while the lobular structure was preserved (Figure 1). The genetic test was unavailable at that time and he was diagnosed as acute cholestatic hepatitis. The treatment was listed in Table 1, however, he showed no response to our symptomatic intervene after 1 week. Serious pruritus led to sleep problems and a soporific agent was used to help his sleep. Plasma exchange (PE) was conducted to him. After 8 times of PE, the patient told us an obvious alleviation of clinical symptoms. Then, he refused further treatment and was discharged with a TBIL level was 186.4 umol/L. After 12 days, he suffered severe pruritus and icteric urine and was then readmitted to our hospital. The laboratory data showed TBIL 239.1 umol/L, ALT 100U/L, AST 102U/L, and ALP 235U/L. He accepted the symptomatic treatment again, however, refused any plasmapheresis operation. His asymptomatic and laboratory normal recovery was achieved on Nov. 2010. The duration of the first attack was 5 months and the maximum TBIL level was 426.6 umol/L. His second attack was in July 2012 and lasted for 2 months. Although we advised him to avoid any agents or drugs that could harm hid liver, he stubbornly used herbal drugs (with unknown gradient) for 1 week until he was readmitted to our hospital with fatigue, pruritus, and jaundice. The laboratory data was TBIL 145.2 umol/L, ALT 55U/L, AST 54U/L, and ALP 232U/L on day 1 of his hospitalization. The TBIL reached the highest level of 357umol/L on day 22. The patient denied plasmapheresis operation. Our therapeutic regimen was the same as in 2010 excluding steroid. Steroid was ruled out due to the fact that the patient was afraid of the side effects. His symptoms and biochemical parameters subsided and reached baseline level after 2 months. As the typical episode of this patient, we suspected him to be of the familial intrahepatic cholestasis. His resent attack happened in April 2016 and lasted for more than 6 months (Figure 2). At the beginning, the patient chose symptomatic treatment as he did 3 years ago. Our treatment was the same as in 2012 but this time steroid was added. 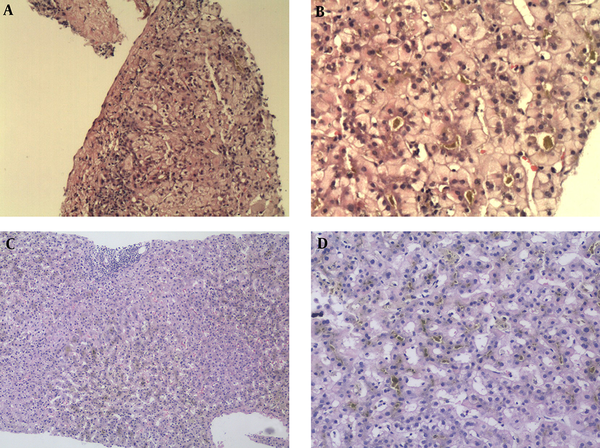 During his hospitalization, the second time, his liver biopsy showed diffuse cholestasis in hepatic lobules (especially in zone 2 and zone 3) and mild inflammation in portal tract area with no signs of cirrhosis and architecture alterations (Figure 1). Whole exome-sequencing was performed and genetic analysis found 4 mutations in ABCB11 and 4 mutations in ATP8B1, respectively (Table 2). Of note, 2 mutations in ABCB11 (c.70A > T, p.Lys24*; c.1417G > A, p.Asp473Asn) were never reported before in BRIC. The patient finally confirmed the diagnosis of BRIC. His TBIL level was increasing to 518 umol/L on May 2016 and plasma bilirubin adsorption (PBA) was conducted for him immediately. After 3 times of PBA, the patient had an obvious alleviation in clinical symptoms and his TBIL was 231.6 umol/L, which was markedly reduced from its maximum level. After discharge, he continued out-patient treatment and did a routine examination in Nov. 2016 showing that his TBIL level was 43.6umol/L. The duration of the attack 3 lasted from April 13 to November 1 in 2016, the maximal level of TBIL was 518 umol/L and the TBIL level on remission was 43.6umol/L. The arrows indicate the dates of PBA conducted for the patient. (Total bilirubin, TBIL; alkaline phosphatase, ALP; total bile acid, TBA; aspartate aminotransferase, AST; alanine aminotransferase, ALT; plasma bilirubin adsorption, PBA). Familial intrahepatic cholestasis is a heterogeneous group of autosomal recessive liver disorders characterized by intrahepatic cholestasis, which can be divided into 3 main groups based on phenotypical differences: progressive familial intrahepatic cholestasis (PFIC), BRIC, and intrahepatic cholestasis of pregnancy (ICP). PFIC and BRIC can be further subdivided into 3 types by causative genes: (a) BRIC1/PFIC1, with mutations in ATP8B1 and a low/normal GGT level; (b) BRIC1/PFIC2, with mutations in ABCB11 and a low/normal GGT level; (c) BRIC3/PFIC3, with mutations in ABCB4 and a high GGT level (4, 7). The differentiation between BRIC and PFIC is based on phenotypic presentation: BRIC is characterized by intermittent recurrent cholestatic episodes, without evident liver damage, cirrhosis, and hepatic cell carcinoma. PFIC is progressive and could lead to end-stage liver diseases. It is thought that BRIC and PFIC are 2 ends of a continuum. In some cases BRIC could progress into PFIC, however, the inner mechanism is still unclear (8, 9). All 3 causative genes of BRIC encode hepatocanalicular transporters: ATP8B1 encodes an amino-phosphlipid flippase translocating phospholipids from the outer to the inner leaflet of the plasma membrane, which helps protect the membrane from high bile salt concentration in canalicular lumen and to maintain its integrity; ABCB11 encodes the bile salt export pump (BSEP), which is the main exporter of bile acids from hepatocyte to canaliculi against a concentration gradient; ABCB4 encodes the multidrug resistance protein 3 (MDR3) functioning as a phospholipid floppase translocating phosphatidylcholine from the inner to the outer leaflet of the membrane, which is responsible for neutralizing the detergent effect of bile salt (10, 11). Therefore, impair function of these genes would result in the injury of canalicular membrane of hepatocytes and biliary epithelium or bile canaliculi, leading to intrahepatic cholestasis. Numerous mutations in ATP8B1 were detected in BRIC patients, however, not a single mutation was common among different populations. One missense mutation (c.1982T > C; p.Ile661Thr) is commonly detected in BRIC patients of western European origin. Roughly 50% of known ATP8B1 mutations identified to date are missense mutations. Putative splice site mutations, nonsense mutations, and small deletions have also been identified (12). In the present case, 4 SNPs were detected in ATP8B1: c.696T > C, c.811A > C, c.2855G > A, and c.3454G > A (Table 2). All of them were previously known as being related to intrahepatic cholestasis (13, 14). Moreover, both c.2855G > A and c.3454G > A are nonsynonymous single nucleotide polymorphism (nsSNP), which are believed to cause phenotypic variety of human disease between individuals (15). By considering that the conservation of amino acid residues in mammalian proteins homologous to ATP8B1, one can predict whether a missense mutation would lead to a mild disease phenotype or to a more progressive phenotype. Consistent with this opinion, point mutations in PFIC1 patients often affect conserved amino acid residues but the BRIC1 patients are on the contrary (4). ABCB11 is a member of the ATP binding cassette (ABC) superfamily (11). There are also 4 genetic variations detected in our case. Both c.3084A > G, p.Ala1028 = (rs497692) and c.1331T > C, as well as p.Val444Ala (rs2287622) are known SNPs. The allele frequencies of rs497692 and rs2287622 in familial intrahepatic cholestasis were 67.2% and 74.5%, respectively. The c.3084A > G polymorphism could promote exon skipping and disrupt gene splicing, resulting in impair function of BESP. Similarly, the SNP variant A444 could reduce the levels of BESP protein compared with V444, which was also associated with drug-induced liver injury and intrahepatic cholestasis of pregnancy (ICP) (16, 17). Importantly, 70A > T and c.1417G > A in our case were firstly reported in BRIC patient. The Mutation Taster prediction analysis indicated that both novel mutations are disease-causing-automatic and known to be deleterious. However, further study of these two mutations in the development of BRIC is still needed. In our case, both ATP8B1 and ABCB11 genetic aberrations were detected. Which type of BRIC did the patient have? The common agreement is relied on which genetic variation is playing the predominant role during the disease process. Phenotypic characterization could help distinguish BRIC1 to BRIC2. ATPB1 is expressed in many tissues, abundantly in the pancreas, intestine as well as liver. The common extrahepatic features in ATP8B1 caused BRIC1, such as watery diarrhea, pancreatitis, and hearing impairment, which were absent in our patient. Thus, together with clinical presentations and genetic discoveries, we finally diagnosed the patient with BRIC2 (18). No medical intervention was consistently successful in BRIC to date. Cholestyramine has been used since BRIC was first recognized, although, without much success. In patients with ABCB4 deficiency, UDCA should be the first-line choice. However, the result of UDCA treatment in patients with ATP8B1 deficiency was controversial. Due to the fact that rifampin can generally relieve pruritus symptom in patients with cholestasis, it had also been considered in BRIC treatment. Use of rifampin could completely terminate an attack in some cases. When the patient’s liver enzyme was elevated at that time, rifampin was not in our treatment regimen for its liver toxicity. Surgical intervention like partial biliary diversion (PBD) and ileal exclusion have been successfully practiced in some BRIC patients. However, the permanent character of these operations makes them less suitable for patients with episodic BRIC. Temporary nasobiliary drainage (NBD) was effective in some BRIC patients. It could resolve pruritus and normalize bile salts in a short time. Liver transplantation was only considered in a few severe patients. Besides, plasmapheresis is also an option for the treatment of BRIC. Some studies reported the early use of plasmapheresis within 2 weeks after disease onset could shorten the duration of an attack, while other studies also had negative results (2, 4, 19). In our case, the patient was conducted with PE within 2 weeks after his first onset, nonetheless, the TBIL still reached its maximum level after 8 times of PE treatments. In our observation, neither medication nor plasmapheresis interventions had effects on the natural process of BRIC, however, it could help alleviate the patients’ clinical symptoms. It should be noticed that to date, evaluation of treatment efficacy in BRIC was only based on the single case report. Well-designed and multiple-centers prospective studies are needed, ideally with an intervention based on insight in the function of the proteins encoded by the causative genes. However, the limited patient number and the unpredictability of BRIC make it very difficult to design a randomized controlled trial (RCT). Therefore, single patient trial, also known as n-of-1 trial, could be a useful tool. N-of-1 trail is a multi-period crossover experiment comparing 2 or more treatments within 1 patient. It has been widely used in education and behavioral studies. Many physicians recognize that the nuances between different individuals and therapies should be tailored for the individual character, however, not only in a systematic manner across every patient. Therefore, n-of-1 trial, which focus on the objective determination of the optimal therapy for a single individual could help improve the clinical outcome of the patients. As the chronic, benign result, and recurrent episodic characters of BRIC, N-of-1 trail would be suitable for evaluating the treatments of this disease (20). In conclusion, we report a Chinese male with clinical approved and genetic diagnosis of BRIC. Both medication and plasmapheresis interventions could relieve the patient’s symptoms, however, neither could shorten the natural process of the disease. Two novel mutations in ABCB11 (c.70A > T, p.Lys24*, exon2 and c.1417G > A, p.Asp473Asn, exon13) were first detected and could help further understand the mechanism of BRIC development and design mutation-specific therapies for the patients in the future. Authors’ Contribution: Haibing Gao and Shenglong Lin contributed equally to this work. Study concept and design: Haibing Gao, Minghua Lin, Shenglong Lin; acquisition of data: Huaxi Ma, Xiangmei Wang, Wenjun Wu, Jiahuang Lin; analysis and interpretation of data: Jiankai Fang; drafting of the manuscript: Shenglong Lin; critical revision of the manuscript for important intellectual content: Haibing Gao, Minghua Lin; administrative, technical, and material support: Xujiang Lv, Xiumin Chen; Study supervision: Minghua Lin. Funding/Support: This study was supported by the grants of Innovative Scientific Research Project of Fujian Province, China (No.2015-CXB-29), Middle-aged and Young Talents in Health Science Fostering Project of Fujian Province, China (No. 2016-ZQN-77), Natural Science Foundation of Fujian Province, China (2017J01160) and the Key Clinical Specialty Construction Project of Fuzhou City, Fujian Province, China (201510301).